Sport Pilot Airplane: A Complete Guide provides an in-depth understanding of light-sport aviation complexities. Clarifies points commonly misunderstood, provides a wealth of information on subject such as Selecting an Aircraft, Pilot and Aircraft Certification, Weather, Flight Principles, and more. Includes 256 pages with illustrations, photos, or graphs on nearly every page. The material presents the experience of thousands of flight hours and contains valuable lessons for all pilots and would-be pilots. A serious text written in a fun and witty style. More than 1,100 original illustrations and photos with 64 pages in color, ensures this to be a one-of-a-kind manual. You can learn or review by just looking at the pictures. However, the text is laced with Machado;s humor, so you will want to read every last word of the 572 pages. Written in the first person, it's as if Rod is sitting next to you, personally explaining all the necessary aspects of flying to make you an informed, confident and competent pilot. It is the first book of its kind completely written and illustrated by one instructor, a CFI with more than two decades of teaching experience, 8,000 hours as a flight instructor and 600+ aviation seminars under his belt. 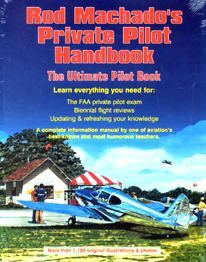 Flight instructors will love using the great illustrations with their students. It will also be a favorite for its readability. It's perfect to refresh for a flight review, catch up on new rules or for student pilots to pass their FAA knowledge and oral exams.